With a standard length of 14 feet, a pair of Fat Straps™ can secure an entire quiver of your favorite boards to your car rack. 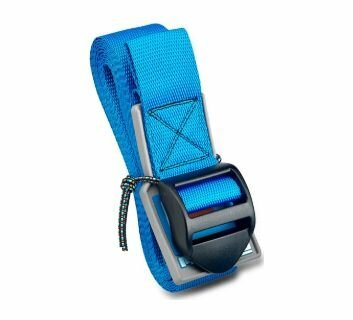 Long enough to loop THROUGH your vehicle, making them the perfect travel strap. Also available in custom lengths. 4X the sewn-in strength of 1” straps. Exclusive Neoprene Buckle Base™ foundation provides an extra measure of cushy protection for your boards. Made from upcycled 2mm wetsuit neoprene, keeping scraps out of landfills. The built-in Fast Snap™ loop keeps your straps rolled and tidy when not in use. Get rid of that milk crate full of inferior, knotted up straps and bungees in the back of your rig. Fat Straps™ are the only tie downs you need.